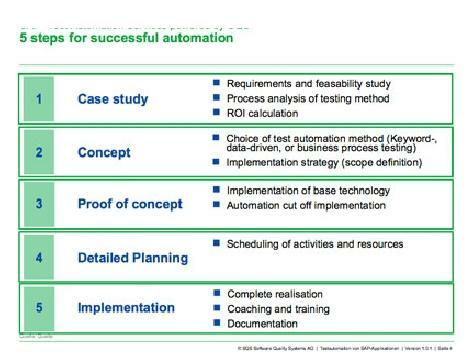 Choosing the SAP automation strategy. HP Quality Center (QC) is an example of a tool that connects the modular business process method and the keyword-driven approach. With the help of the QC module BPT (Business Process Testing), business processes can be joined up like building blocks to form a chain. The test data can then be attached to the individual links in the chain (the business components). Each chain forms a business transaction, with the relevant user department providing the input for each individual business component. The business experts are responsible for verbally describing the links in the chain, while the engineers translate the descriptions into test scripts. This gives the testers who assemble the new chains – or test cases – the advantage of being able to build on links that already exist. Test cases do not necessarily have to be fundamentally different from one another. If, for example, a chain for a business process comprises 100 test links, it is highly probable that many individual links can be used from other chains. An example of this is the process of logging on to SAP systems, which does not have to be described and defined a new once SAP logon has been specified for the first time. This link in the chain would also weather an upgrade. And, with such a description and automated testing, there’s a pleasant side effect for the company doing the testing: It receives an overview of the brainware in its user departments, displayed and clearly structured in test scripts. Non-SAP test tools pass muster particularly in test automation that entails testing integrated business processes with systems from third-party providers as well as from SAP, such as for customer relationship management (CRM) or content management (CM). eCATT from SAP immediately registers if a certain test script no longer runs on a certain software transaction due to changes – and in such cases provides the relevant analyses and evaluations. It is, however, quite possible that a function that has been changed in the SAP application has no impact whatsoever on the test case for a business process that works by using integrated systems from several providers. In such instances, an external tool such as HP QuickTest Professional has the advantage of only examining those parts of the system that are actually involved in the business process to be tested. The test case can therefore still be executed – despite a change in the SAP application.